My kids were invited to a birthday party of a little boy who lives on the corner of our condo block this past Saturday. He was turning the big 5 - half a decade old. For the past three years that he and his family have lived in our condo complex, his parties have become legendary, each one more elaborate than the previous year's. There is lots of rich food, fabulous desserts and activities galore. This was the first time my family was invited to attend. Knowing the reputation of these parties being banqueting feasts, we gave our RSVP. However, we were not prepared for the scene of ugliness that would conclude the celebration. First, it began with the Super Party Jumper. 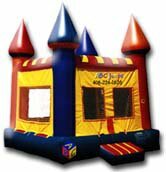 I don't know how you all may celebrate your children's birthdays outside of Southern California, but here the trendy thing to do is to rent a party jumper, a large inflatable enclosure where kids can jump around. It is similar to what I remember at our county fair as being called a "moonbounce" house. We rented one for my second oldest boy's first birthday party. Of course with us and our friends, there were probably three parents watching for every one kid bouncing. So, with the proper amount of parental supervision, a party jumper can be a ton of great fun for a party. However, without parental supervision, they can quickly become a severe head trauma or some other crippling injury just waiting to happen. My two boys wanted to do nothing but jump in this thing, so my wife took their shoes off and as she went to put them in, the thing was filled with dozens of kids, but no parents paying attention. They were all aloofly sitting in the garage or talking to one another. My wife had to protect my boys from this pre-teen mosh pit all by herself. One little girl was karate chopping at any boy who came near her, while some boys were slamming themselves into everyone else. My second oldest didn't even really bother to get into the jumper all the way. The oldest one did, but got a tad discouraged by the violence. Thankfully they survived. After we ate some excellent chicken and tortillas, the dad hosting the party breaks out a massive clown shaped pinata the size of a 10 year old. As soon as he walked out with it in his arms, all the kids swarmed to the guy like Palestinian protesters on a burning car. It was one of the largest pinatas I had ever seen, and he was struggling just to hoist the thing over his head and out of their reach so it wouldn't be destroyed before anyone had a opportunity to take a swing. A couple of men strung it up with a rope and the birthday boy takes his swing with a wooden broomstick, but misses. Just before they could get the blindfold on the chubby girl who was to go next, she whipped the broomstick through the air and came down on that pinata with all the force an 80 pound 7 year old could muster. She disemboweled it from chest to tummy and candy gushed out all over the ground. All of the kids reacted at once. It was as if someone threw a live squirrel in among a hundred German Shepherds. Squealing, screaming, punching, grabbing, and worse of all, mom's and dad's yelling at their kid to "get it, get it, get it before he or she does!" 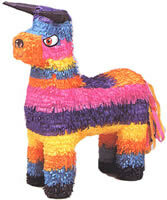 Then two other girls grab the pinata, one on each leg, and start tug-o-warring as if it were a giant wishbone pinata. The legs came off, slinging even more candy into this brawl, and left the torso of the clown pinata dangling from a tree limb like a scene reminiscent from "Scarface" (those who saw the movie know exactly what I mean). Little girls were sobbing, boys were squishing Reese's Cups as they wrestled with each other to get them for themselves, and my two boys stood there with their paper bags open and empty, blankly starring at the melee. That was our cue to say good-bye. All of my neighbors are tremendous folks. They are sweet, kind, and ready to help each other if need be. But I have to confess that I was stunned with how quick this dog eat dog, survival of the fittest mentality just appeared out of no where among their children. Hollering at your kid to grab up as much candy as he or she can gather? What are we teaching them with such a response? Has our American materialism driven us to a base level of civility? We live in a society for goodness sake! We have to teach our kids the foundational principles of sharing and cooperation. Surely Sesame Street is still running on PBS, right? Thankfully, there was one bright spot: A little girl who was playing with one of my sons earlier shared her candy with them before we left. Perhaps we are not doomed to re-live another Superdome like incident at next years party. Wow Fred you make me glad that my children's birthdays were sedate affairs with none but close family attending.